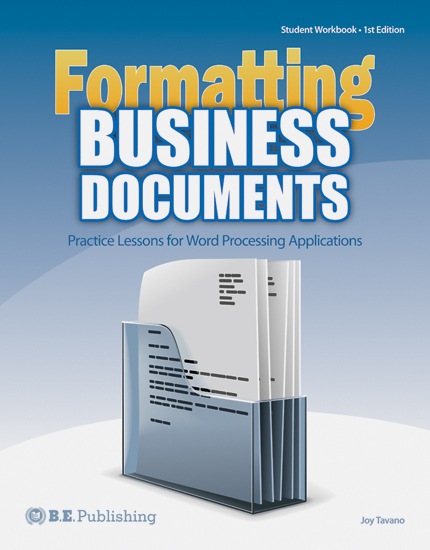 Students practice formatting the most common business documents using any word processing application. 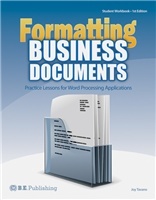 Formatting Business Documents teaches the guidelines for formatting 16 of the most common business documents. From resumés and cover letters, to business letters and memos, students gain hands-on word processing skills to produce professionally written and formatted documents needed in their future business careers. Real-world scenarios highlight relevant, accessible topics and content. Designed for all versions of Microsoft Word, Google Docs, or equivalent applications. Using real-world scenarios, students will learn the importance of how writing effectively and formatting documents properly is an essential ingredient to the success of their professional growth. From resumes, cover letters, and memos, Formatting Business Documents is a staple resource and learning tool for every student. Each document includes content focused on topics and themes students will instantly connect with. The Online Instructor Resources for Formatting Business Documents include Lesson Answer Keys as well as Written and Performance Assessments. Written Assessments assess students' knowledge of the various types of business documents, while Performance Assessments allow students to demonstrate their document creation skills. Written Assessments measure students' comprehension of the importance and features of each business document introduced in the book. Question types include true/false, multiple choice, and fill in the blank. Performance Assessments measure students' ability to create each document introduced in the book.